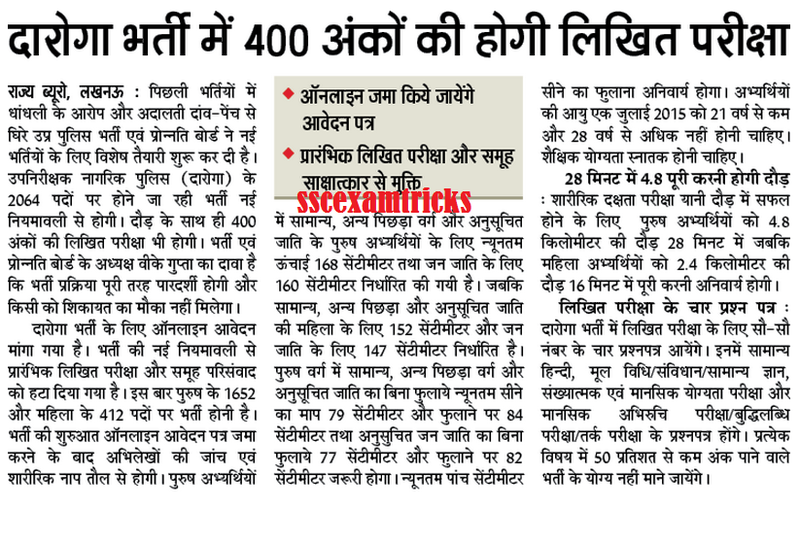 UP PRPB Police Revised Selection Process - Check UP PRPB Police Constable / Darogas/ Inspector Newest Syllabus & Selection Process of UP Police Recruitment 2015: Uttar Pradesh Police Recruitment Promotion Board has released latest / newest selection process for the recruitment of 2064 posts of Darogas (up-nirikshak nagrik police). The selection process has been revised in which interview process has eliminated. The final selection will be made on the basis of performance in Physical Efficiency Test (PET) and Physical Standard Test (PST) followed by written test. The PET/ PST will be held for qualifying nature only. The shortlisted candidates will be called for written exam. The written exam will be comprised of 4 papers for 400 marks. It is mandatory for the candidates to score more than or equal to 50% marks in each paper. Those candidates who will score below 50% marks, they will be eliminated from the selection process. Then final cut off list will be released in which provisionally selected candidates will be called for medical examination. After successful medical examination, the final appointment / allotment of station to the candidates will be made. Long Jump- 2.7 metres (9 feet) in 3 chances. Written Exam: Includes four papers of General Hindi, General Knowledge, Numerical Aptitude and Reasoning. Each paper will be held for 100 marks.